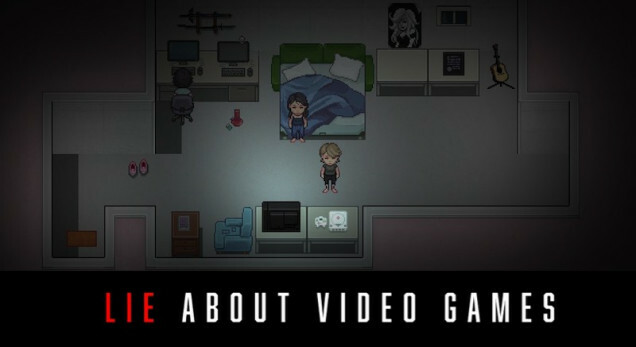 Little Red Lie adds a lot of things to the narrative game genre, but throughout I was fascinated by all the tricks used by developer Will O’Neill to subvert audience expectations and drive home the game’s core themes. 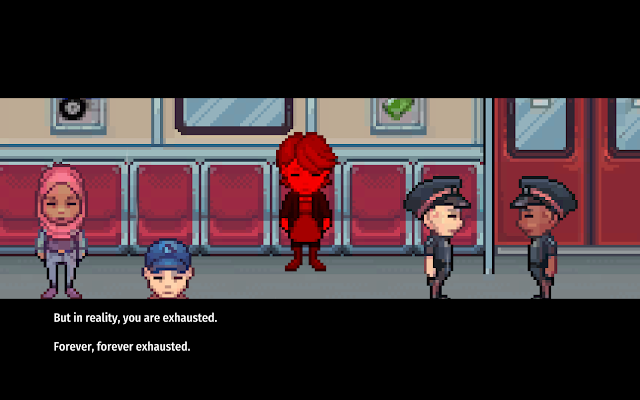 This is a game with a razor-sharp critique, skewering the notion of happiness earned through capitalism by portraying two stories illustrating how money and luxury lead people down a self-fulfilling path of self-destruction. Matt clearly outlined the game’s core merits in his review, so I thought I would take a more in-depth look at the game’s sense of ludology and design – less “what the story is” and more “how is the story told”. I hope this analysis will shed some light on an often-misunderstood school of game development, and foster a new appreciation for Little Red Lie as well as narrative games as a whole. Related reading: Matt's review of Little Red Lie. There are lots of great definitions for what specifically constitutes a “game”, but for the purposes of this article I want to propose that a game at its most basic form is a series of graphics, text, animations and outcomes governed by key mechanics and interacted with by a player. In all games, the mechanics limit the ways that players can interact with the game, creating a possibility space to perform actions which we call verbs. A verb is anything that the player can do – usually mapped to a button on the controller. In a platformer, the verbs are to run and to jump; in a visual novel, to choose; and in a walking simulator, to move and look. By this definition, “not-a-game” is a work without any verbs: one where you set the controller down and watch the piece unfold from beginning to end with no actions required in between, as you would a film or a novel. Most games which we consider to be “artful” are careful with their verbs, leaving players with just what is necessary to convey the narrative. As a work of minimalism, Little Red Lie has only one meaningful verb: “lie”. It bears a striking similarity to Will O’Neill’s previous game, Actual Sunlight, in that it’s not a game in which you can do things, but rather one in which you are complicit with things being done to you. The latter was frequently compared to Depression Quest for its subject matter, but mechanically the two are extremely different: Depression Quest gave players choices so that they could see the results of those choices. Actual Sunlight, and now Little Red Lie, don’t. 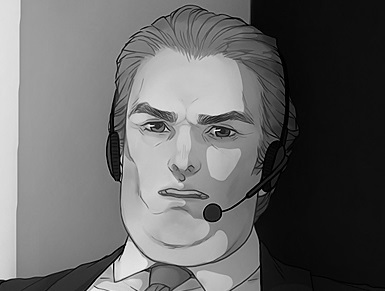 Just like how in a Mario game, you can’t shoot your gun because you don’t have one, and you can’t fly because gravity will hold you down, in Little Red Lie you can’t exert any agency because you don’t have any, and you can’t speak the truth because a myriad of prior obligations hold you down. The only verb available to you is to lie, to perpetuate the same terrible routine which drives you deeper into all-encompassing pessimism. There’s also a front-footed defensiveness about how the game assumes some of its playerbase will be expecting a proper “game” with win states and a Hollywood-style story which they can put down after finishing and never think about again. In some of the game’s most memorable moments, it is as if the developer is reaching through the screen to shake you by the shoulders and ask if you are listening – O’Neill evidently has no patience for the complacent player who ploughs through content with disinterest. The message is here: fail to listen and the game will punish you. And yet at the same time, the game is no kinder to players expecting a well told story. At the beginning of the game, players are required to give some brief details about their financial status, being told that this information will affect their play experience. The first scene in the game is also a metafictive vignette, ruminating on how dystopias in fiction are terrible but exaggerated far enough that they are unrealistic, and that by putting the book down the reader solves all the problems of that fictitious society. The narrator, Sarah Stone, remarks that in reality, things don’t change and there is no escape – and these two scenes drive the message home to the player that they can’t hide behind the wall of “It’s just a game”. This game indulges in moments of abrasiveness to ensure that the player will walk away changed, or at least after deep introspection of their own circumstances. If there’s any solace at all in the unrelenting pessimism of Little Red Lie, it’s in the framing of each vignette as a particular snapshot – a segment of a novel, or at least a biography – slyly alluding to its state as a fictive construct. These characters are neither real nor based off real people, and I would certainly hope they do not exist in reality, but with a dark apprehension assume that they probably do. It does mean, however, that at the end of every vignette there is a fade and transition to the next one to remind you that you are playing a game. It also helps that the characters are designed to be critiqued: their internal monologues will be contradictory, so the more attentive of players will get a better sense of who the characters are than even they do themselves. And yet, neither character reads as a complete caricature. Much attention is given to give some semblance of humanity to each character – even the sociopathic and egomaniacal Arthur Fox is driven by a crippling and relatable desire for wholeness that nothing in his hedonistic life can provide. Sarah’s teetering between love and frustration for a sister with depression also rings true to many a real-life experience. Throughout the game I kept encountering situations which have either happened to me, or I was certain would happen at some point in my life. I kept thinking about what I would do in their situation. This brings me back to everything I’ve said about verbs and gameplay. I’m sure there will be opinion pieces on the Internet arguing that Little Red Lie doesn’t have gameplay, specifically because the choices for the most part don’t do anything. It is, however, not about what the choices do, but what the player does when they choose. The player is never given the choice between whether to tell the truth or to lie. They are always given the choice between three truths – functionally the same barring difference in tone: one might make your character seem more sympathetic, another, more vindictive. And yet, regardless of how you think, the words which exit your character’s mouth betray you. No matter what truth you want to tell, your character lies – just as you would in real life in the same situation. You can’t tell your friend that their boyfriend is a jerk because it would hurt their feelings. You can’t tell your meek client they are pathetic because they are paying you to give platitudes. You can’t confess about the direness of your financial situation because it would drive your family to worry. No matter how much you want to, you can’t change anything. Ultimately, Will O’Neill draws narrative strength from the game’s mechanical restrictiveness. Little Red Lie is a game about common tragedies; preventable misfortunes that maybe weren’t so preventable because the truth hurts and we’re all members of a society built upon lies. It’s an indictment of capitalism, and an indictment upon us – the players who unwittingly perpetuate the same lies that Arthur Fox and Sarah Stone do. This is a bleak and cynical game, but an important one too: one day we might find ourselves at a tipping point where the only thing which can save us is to tell the truth, and yet no matter how much willpower we muster, we find ourselves incapable of honesty.